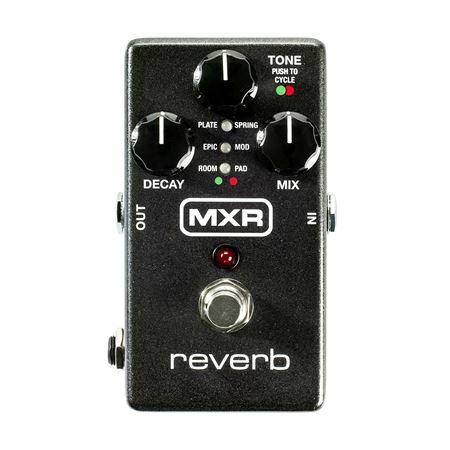 Order your MXR M300 Digital Reverb Pedal from AMS and enjoy 0% Interest Payment Plans, Free Shipping, Free Extended Warranty & 45 Day Money Back Guarantee. Exquisitely crafted and tuned by the award-winning MXR design team, the MXR Reverb delivers six distinct high end reverb styles. It all comes in a standard-sized MXR box with a simple three-knob setup and a hi-fi analog dry path with a massive 20 volts of headroom thanks to Constant Headroom Technology. Each reverb style is as richly detailed as any found in the highest-end rack units and plug-ins, and all you have to do to step through them is push the Tone knob. The Reverb pedal of Reverb pedals! If you aren't sure what kind of Reverb you want, or you currently own two or more different reverb pedals, sell them and buy this work horse! So many different reverbs all packing neatly into a sleak MXR frame! This Reveb was the thing i needed!! What an Awesome Reverb pedal what a great buy and it changed my playing so much and added so much more! Thank you AMS and MXR!